Sundeep Kishan is playing the lead role in the movie 'Okka Ammayi Thappa'. Nithya Menen, who is known for choosing films with strong content, is playing the female lead. The film has completed its censor formalities and it has been given a U certificate by the board. 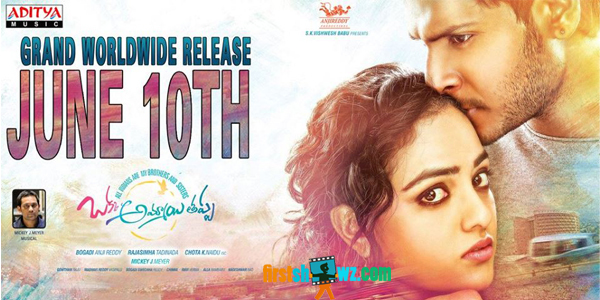 Okka Ammayi Thappa will now release on June 10th. Rajasimha Tadinada is making his debut as a director with this project. Noted producer and exhibitor Bogadhi Anjireddy is the producer for this movie and Mickey J Meyer has composed the music. 'Okka Ammayi Thappa' is a romantic thriller and the film's theatrical trailer has already become popular on YouTube. Recently, Mahesh Babu appreciated the director for the trailer and the quality of the visual effects. Sundeep Kishan, Nithya Menen, Revathi, Ravi Kishen, Ali,Ajay, Thanikella Bharani, Brahmaji, Rahul Dev, Saptagiri, Thagubothu Ramesh, Nalini and other senior actors will be seen in this film.